Like a lot of people, I was enchanted last spring when Kiarane of Casual Stroll to Mordor authored Decoration Ideas: Children’s Rooms. It was an adorable post, and I think this is the second time I’m linking to it, I’m such a fan. My Landroval friend Amimain is a great decorator (and a kinleader, and an occasional writer about roleplay), and has created two children’s spaces that I find simply adorable. 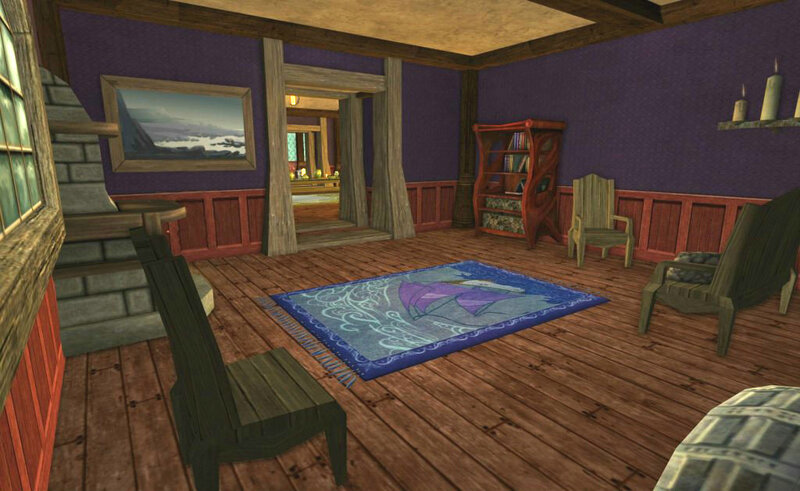 The first is a bedroom for a little boy in the Bree-land homesteads. The boy is obsessed with the sea and sailing, pirates and captains, and likes all manner of little-boy pursuits. 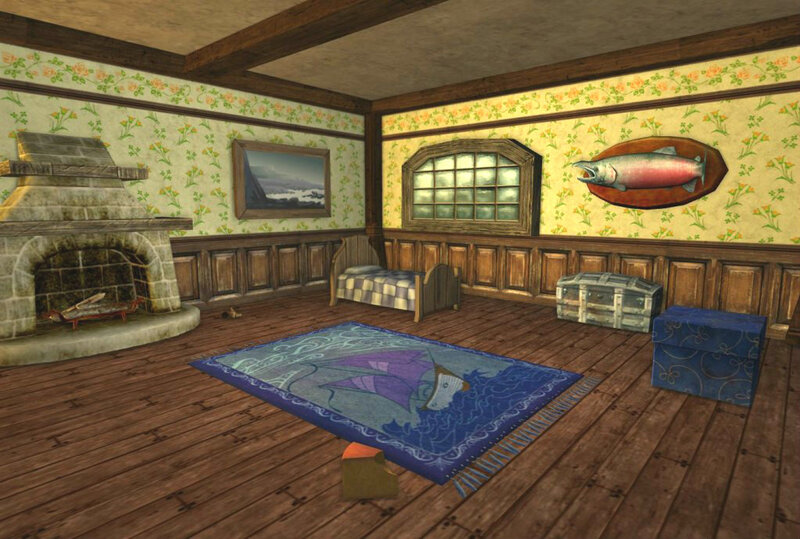 For this nautically-minded young boy, a 40-pounds Salmon Trophy on the wall is a must, as well as the ‘Shore Glimpse’ Painting and the Small ‘High Seas’ Rug. So usually I have no problem coming up with little narratives for my posts. This time, I struggled. Not because I don’t like the topic or the screenshots. Instead, I just found myself saying, “Oh, I like that!” and “Ooh pretty!” So in the end, I decided (as I do with my real-life home) that “pretty” is just fine as a reason to be. 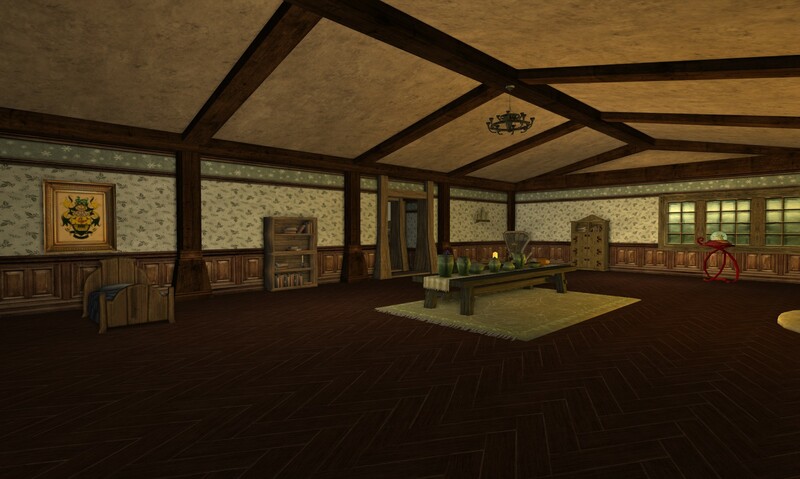 There’s no reason why your in-game house shouldn’t delight your eye! I spend a lot of time roleplaying in various homestead sites. NB: Turbine, I’ll do a lot more rp in busier town areas and meet more people when simple emotes like “Laenlis’s character leans against the stone wall as she listens to the band” aren’t broadcasted over an area three zip codes in diameter. I use my houses as another facet of character, whether it’s to show a certain nationality, a level of riches, an occupation (big-game hunter? scholar? ), or just someone really obsessed with dark wall colors (*cough*). I love the contrast between the purple wall and the rich cherry wainscoting. I tried to echo that same effect by using the Small High Seas Rug on the floor. Here’s a fun bit of house decoration (she said, humbly). 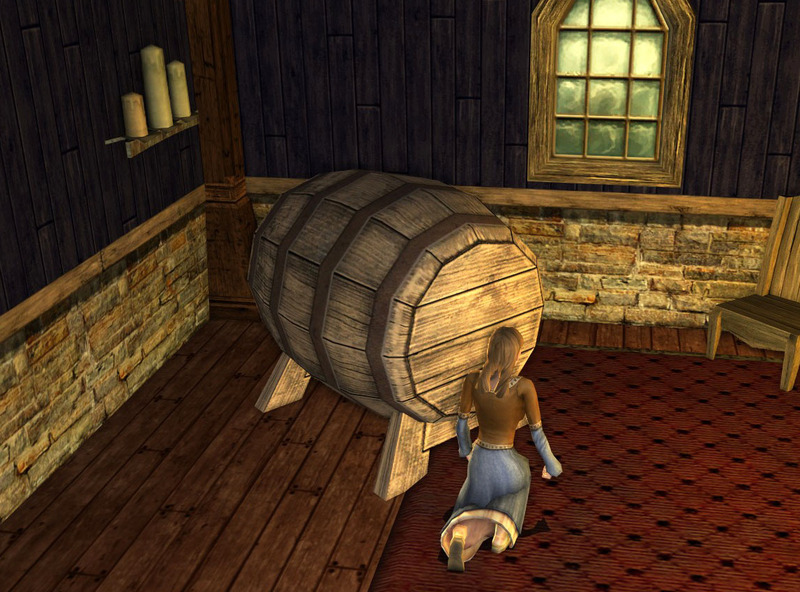 You know that to really feel immersed in your LOTRO dwelling, it takes imagination. Chairs aren’t really ten feet from tables. 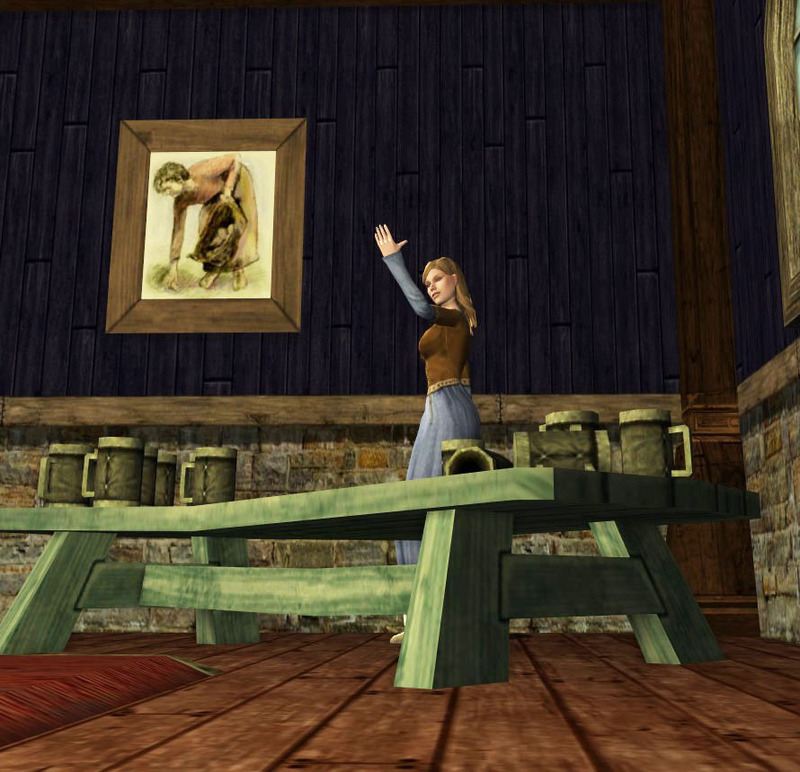 There ARE chairs and tables, even when you stuff your housing slots with palantirs and warg-trophies and Sinister Kegs. At least there are in my mind. Luned here is an actress (in the Gown of Autumn Nights) of some small note, mostly in Bree-town. She and her partner give theatrical performances filled with spectacle! and drama!, and she’s collected the props to prove it. Dragons fashioned from frame and painted canvas, wooden ships and wooden flames, glass globes and elaborate costumes. She has a love of sparkle and jewels and flowers. Conversations with a very flat bear. Luned’s prop-storage house is filled with the various bibs and bobs you earn from festivals and Epic quests, but shabbied down a bit. Palantir? Nooo. Glass globe on a painted wooden stand!